This year, spend less time in the kitchen and more time with your loved ones. We will handle the rest! 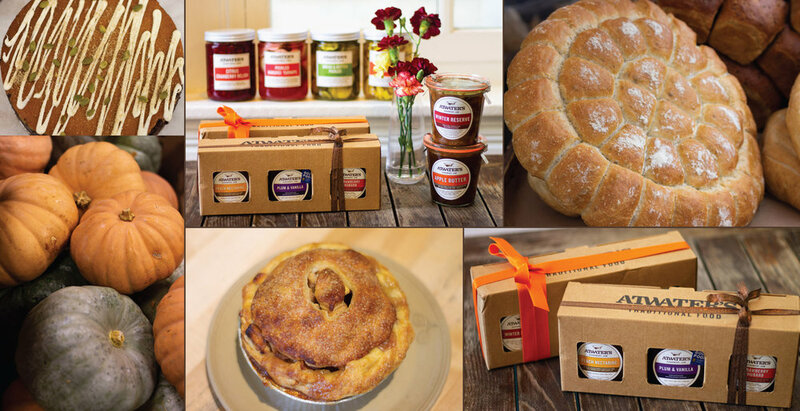 Atwater's has everything you need to prepare an unforgettable Thanksgiving feast. From our handmade soups, breads, sides, delicious desserts and seasonal pies, we can provide everything for your meal—except the turkey! Our menu includes all of your favorite traditional Thanksgiving sides, vegan and vegetarian options, and gluten-free desserts too! So every guest can leave the table feeling happy and thankful for such a wonderful meal. Pick up your order form from one of our 6 locations, or click here to place your order online. All orders must be placed by Sunday, November 18th and picked up at your selected location on November 21st.